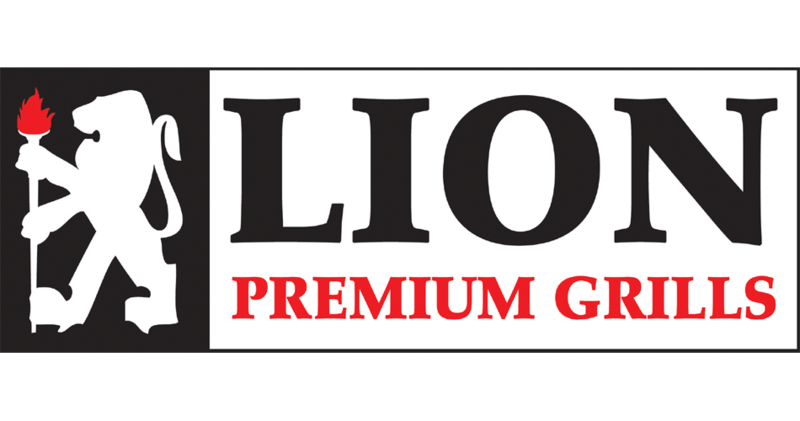 Welcome to the August 2018 issue and 59th edition of the Lion Premium Grills Newsletter! Summer is in full swing which means we have hit the prime season for warm summer nights which are absolutely perfect for relaxing outdoors with friends and family, grilling, and just conversing. Barbecuing during these months is an American pastime and one we hope you can enjoy with our line of grills and outdoor products. This month our newsletter is packed with content which we’ll detail below. What do we have in store for this month’s issue? 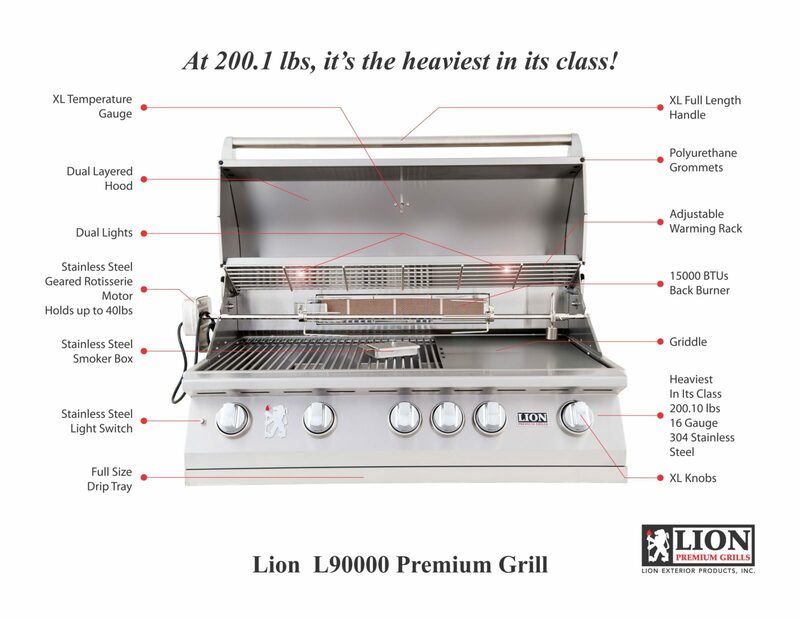 First off, we have an in-depth feature on our biggest grill – the 5 burner L90000 which outputs an impressive 90,000 BTUs. 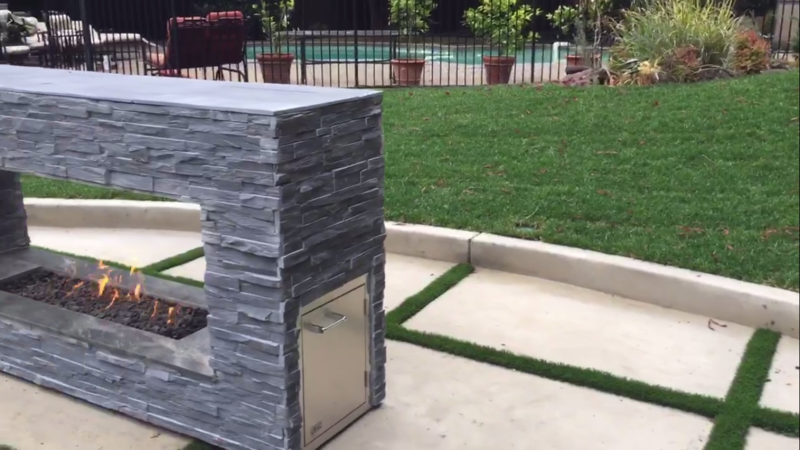 We have an in-depth featured look at a beautiful custom outdoor kitchen / bbq island which is fully loaded with all of our equipment and grill. We also have a feature showcasing another yearly award from Shoppers Choice — this time we were chosen as one of the best mid level grills on the market (other years we received the award for most versatile grill on the market). 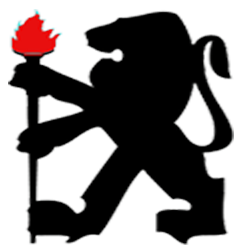 We hope you enjoy this month’s issue and thank you for visiting us at Lion; we greatly appreciate everyone for taking the time out to view our products. Thank you again! 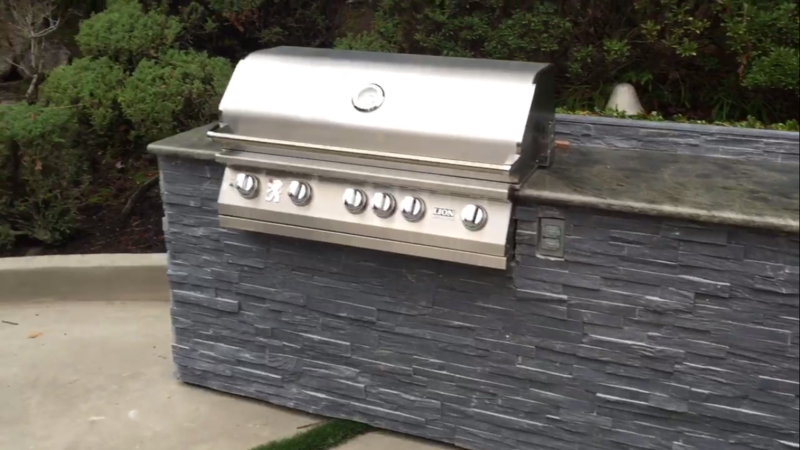 Lion Premium Grills – A Close Look at Our BBQ Grill & Accessories with a Custom Island / Outdoor Kitchen! 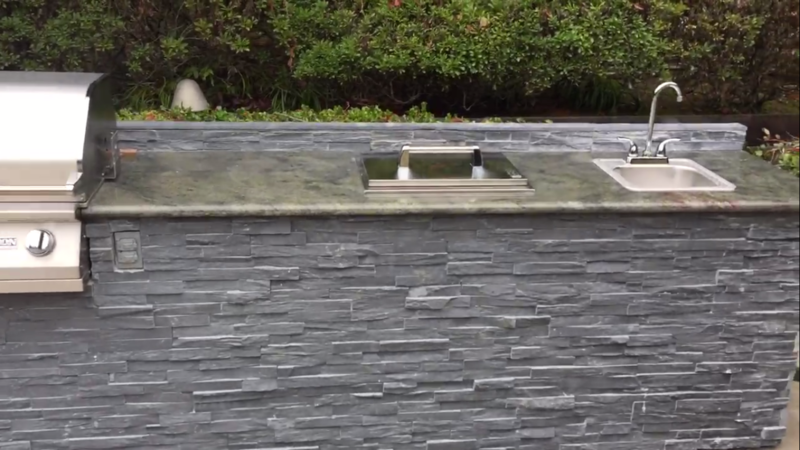 Below you’ll find a video clip along with some still images of a beautiful slate gray customized island crafted by Lion Premium Grills complete with some of our luxury grilling products; you’ll see our 5 burner 90,000 BTU L90000 gas BBQ grill, our stainless steel single side burner, sink, and even our vertical access door built into a customized fire pit seating/counter piece! Seeing all of this in motion really showcases just the kind of quality and painstaking craftsmanship that goes into the production of our goods, as well as how they really add that extra pop to any backyard. 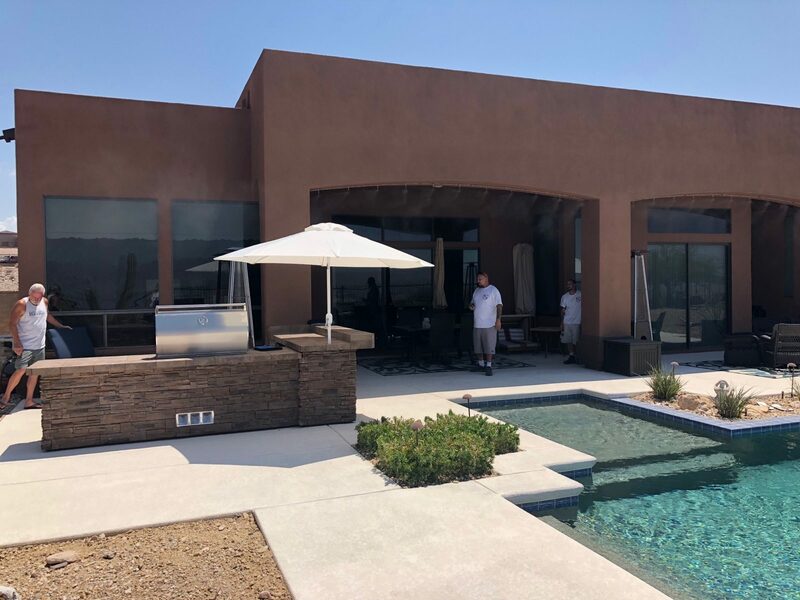 In this initial shot you can get a great look at how impressive a custom outdoor kitchen / BBQ island complete with grill and accessories really is when showcased in an actual backyard setting. 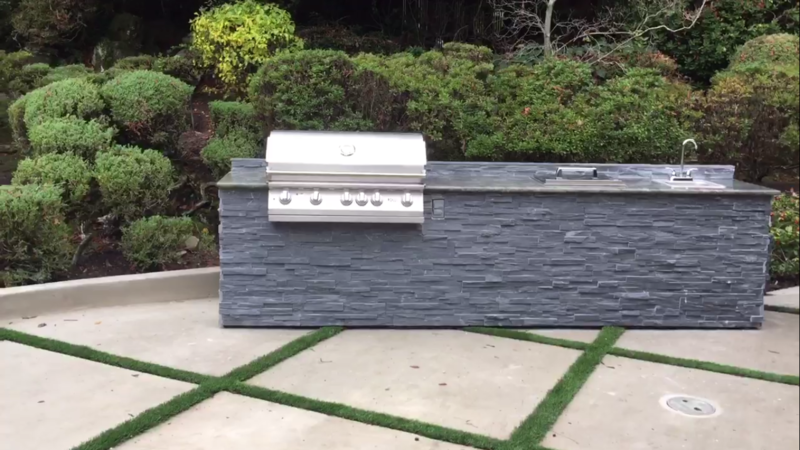 The BBQ island comes complete with a beautiful backsplash and a rock base crafted with a Smokie California charcoal / slate gray finish. It’s a great shot that is really effective at reflecting the proportionality of our products relative to the size of someone’s backyard. 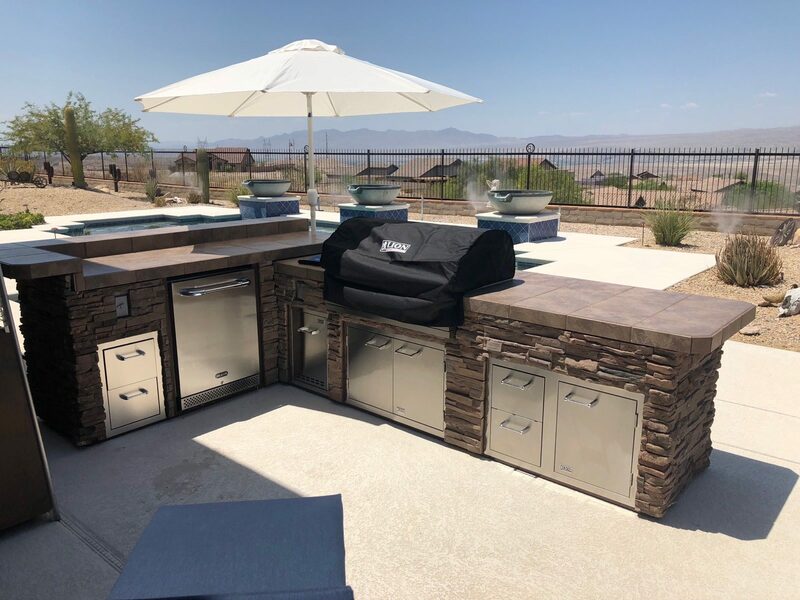 The stainless steel shimmer of our grill, sink, and side burner contrast beautifully with the dark gray colors that comprise the base and luxurious granite countertop of the island. The grill is our signature 40″ 5 burner L90000: a formidable grill that outputs 90,000 total BTUs from cast stainless steel burners. Not only is the cooking power unmatched, the grill itself shows it self to be sleek in design and extremely appealing visually. 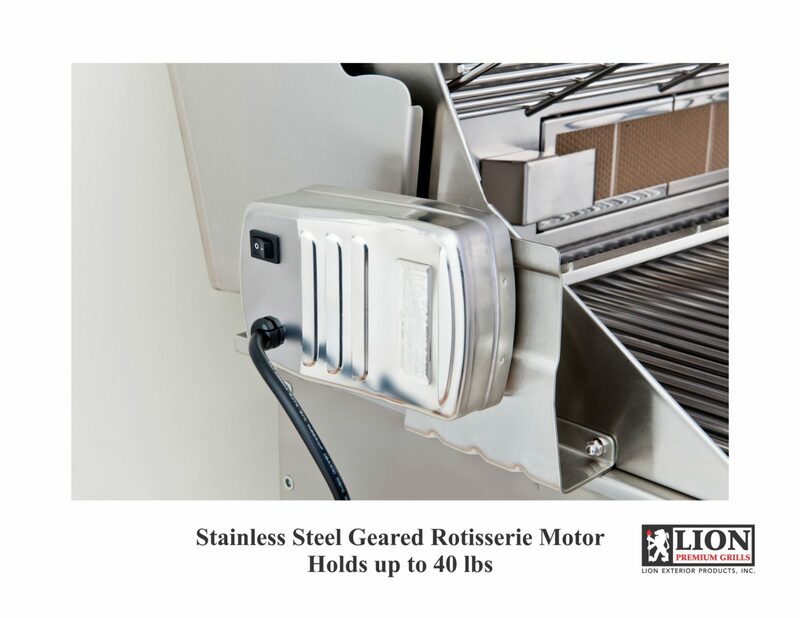 The 304 16 gauge stainless steel material that the grill is crafted from is top of the line quality. Sporting 1,030 sq in. 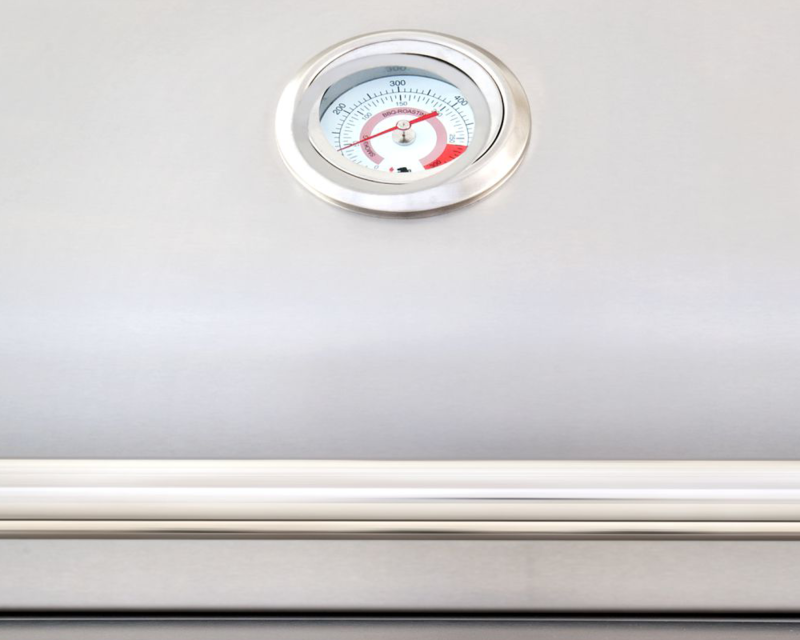 of cooking space means that this grill is extremely large and can handle grilling large amounts of food simultaneously. 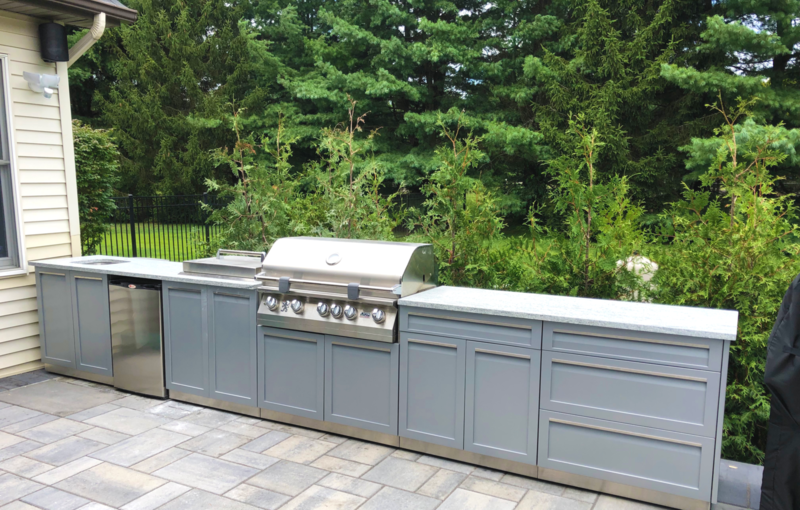 This image shows off two more of our Lion Premium Grills items: the single side burner — which is covered by our sleek, handled stainless steel burner cover — and the bar sink, which is also made from high grade stainless steel. The side burner generates an impressive 15,000 BTUs and comes with a convertible grate that reverses into a wok grate. You can also see the granite counter and rock base up close and in detail in this particular image as well. 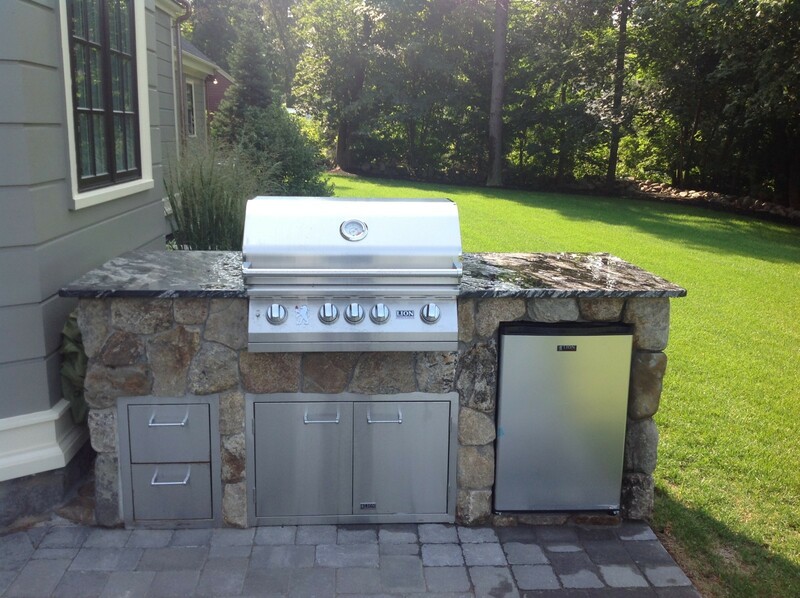 Here’s another angle of the custom island unit as well as the L90000 40″ gas grill. This shot provides a nice look at some of the details on our grill; not only of the polished look of the grill knobs, but of the size, placement, and functionality of the hood thermometer. The detailed touches such as our Lion logo and nameplate on the face of the grill add that extra visual dimension to our product. 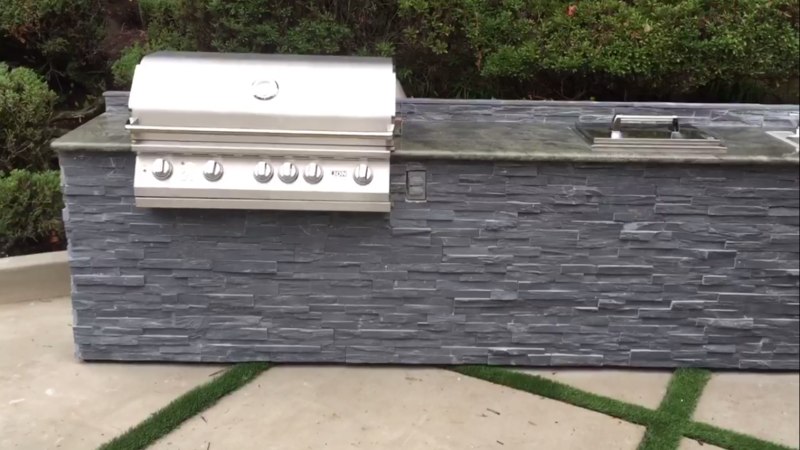 This image shows off an amazing centerpiece crafted from the same rock finish as the BBQ island in this set of images (and video). The gas firepit is beautiful no question about it. You can also catch a look at our vertical stainless steel access door, but in a slightly different setting. The door looks very much in place and fits the high end look of the piece; the handle is functional and well designed as far as placement and the small, subtle Lion logo adds a touch of detail. We have one of the finest takes on an all-time BBQ classic — BBQ pork ribs — for this month’s featured recipe from Chef Tim Love (the owner of White Elephant Saloon, Lonesome Dove, and Queenie’s Smokehouse in Texas) who is known for his unparalleled expertise when it comes to BBQ and grilling techniques. 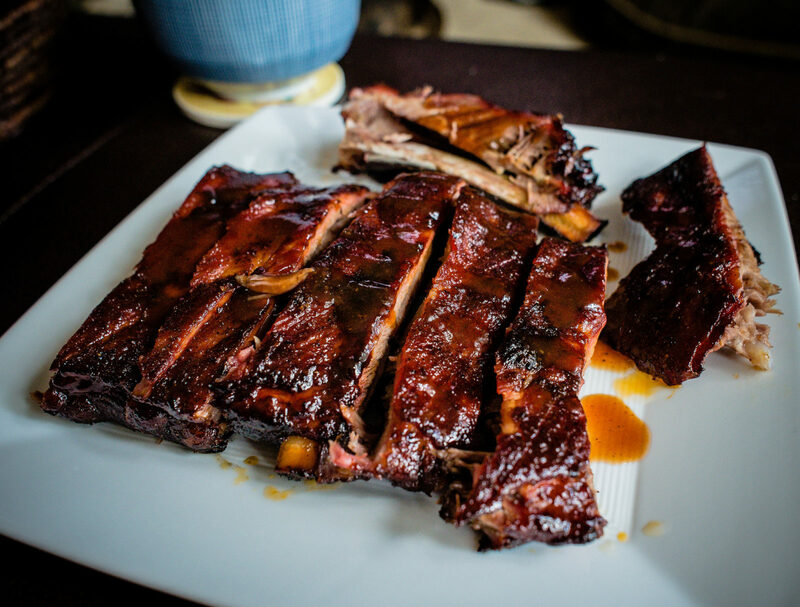 If you are looking to make the perfect smoked baby back ribs there is no better person than Chef Love to guide the way. Below you’ll find the recipe for his mindblowingly tender smoked baby back ribs. We hope you enjoy this recipe as much as we do! 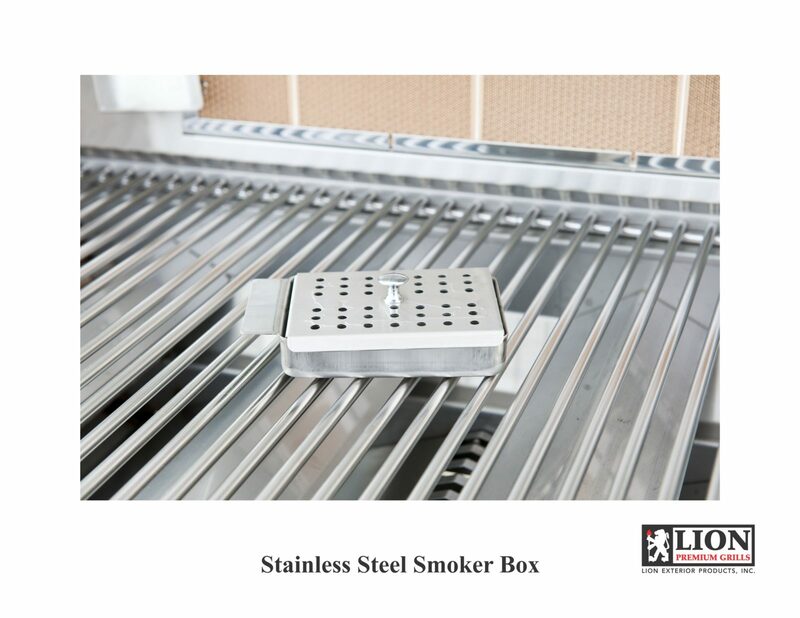 Prepare the grill for indirect heat: If you don’t have a smoker box, you can build a fire on one side of your grill and then put a piece of foil on the opposite side of the grill. This will create indirect heat. Prepare the ribs: Remove the thin, papery membrane skin from the back of each rack of ribs by pulling it off in a sheet with your fingers, using the corner of a kitchen towel to gain a secure grip, or with pliers. Prepare the rub: In a bowl, whisk together chile powder, salt, pepper, cumin, rosemary, thyme, garlic powder, and sugar. Generously season ribs with the mixture, rubbing onto both sides of the rack. Place the ribs, bone-side down, on foil to cook with lid closed. Cover the grill and keep the temperature of the grill at a constant 225-degrees. Cook the ribs for about 3 to 4 hours or until tender.